Over the last six years I have taken part in hundreds of paranormal investigations and, as many of you know by now, I have been obsessed with genealogy since I was in the fourth grade. That said, I am often surprised by how different genealogy and the paranormal are viewed considering the strong similarities between the two. The first similarity, being the most obvious, is the fact that both genealogy and paranormal investigation revolve around researching the dead. When it comes to the actual historical research on a location, all the same steps are taken that would be used to trace an ancestor. Think about it: If the paranormal theories are correct, and locations are haunted by people who have passed, who were those people? Finally both genealogy and paranormal investigation have a common motivator; they are both used to fill our need of keeping the dead alive. Despite these similarities, genealogy is commonly viewed as the past-time of grandparents, while paranormal investigation is extremely popular across all age groups. Why is this? Especially when genealogy gives you the ability to hunt the ghosts of your own past, rather than any old ghost in any old location. Keeping the above in mind, I wanted to share with you one of my favorite paranormal investigations that is a great example of just how much genealogy and the paranormal have in common. Several years ago I had the pleasure of investigating a bed and breakfast in Virginia known as Edgewood Plantation. While there were several paranormal claims reported over the years from owners and visitors, there was one in particular I was assigned to research. The claim was tied to a little cabin in the back of the property, where a woman checked in for a long weekend and claimed she was woken in the middle of the night by the ghost of a Civil War soldier. What’s more, the ghost supposedly introduced himself as Aaron Young III. The following morning, even though she had booked her stay for several nights, the woman checked out saying she was unable to sleep because this young confederate soldier would not stop talking. Since the owner of the bed and breakfast had no knowledge of anyone named Aaron Young being connected to the property, it became my job to research the name. 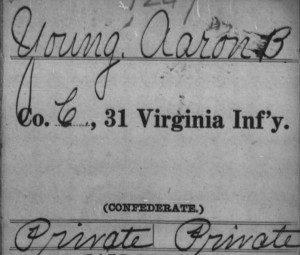 Utilizing the information I was given about the supposed ghostly experience, I decided the first thing to do is check Civil War military records for the name Aaron Young III. To my surprise, a total of nine Aaron Young’s surfaced; six were union soldiers and three were confederate. Since the woman claimed the ghost she saw was a confederate soldier, I immediately crossed the union soldiers off my list. Turning my attention to the three confederate soldiers I found, two were from Virginia and one was from Tennessee. With a bit of digging I was able to determine that the man from Tennessee never fought in Virginia, so I saw no need to research him further. With only private Aaron B. 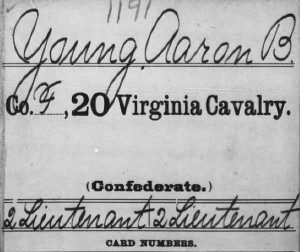 Young of the 31st Virginia Infantry Company C and 2nd Lieutenant Aaron B. Young of the 20th Virginia Cavalry Company F remaining, I began to see some similarities between the two. The most obvious was the middle initial. However, after closer inspection of their military records, I also noticed they shared the same date of birth and place of birth, which brought me to the conclusion they were the same man. Aaron B. Young had started out as a private in the 31st Infantry. Due to the severe number of casualties within that regiment, he was moved to the 20th Cavalry where he was eventually promoted to 2nd Lieutenant. The only thing that left me confused at this point were the several documents contradicting whether or not Aaron survived the war. One record in particular stated he had died at war from a gunshot wound while serving in the 31st Regiment, which was clearly inaccurate since I had proof he went on to fight in the 20th Cavalry. There were also several other records that claimed he died due to illness, while others listed him as absent recovering from an illness. All of this confusion left me with two questions: Did Aaron B. Young survive the Civil War? And was he the third male to carry the name in his family? In order to find the answers to these questions, I turned to the internet. With the basic information I had on Aaron he was not a hard one to find due to his military records. 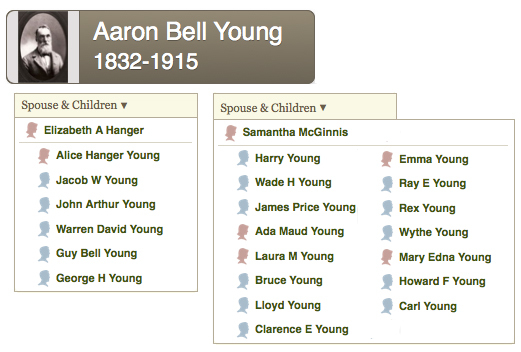 Although Aaron Bell Young was not the third male to carry the name in his family, he did survive the Civil War. In fact, he went on to marry twice and had a total of 21 children. At this point, it would be fair to say that I had become obsessed with researching Aaron’s life and the thought of him possibly haunting Edgewood Plantation. I was left wondering, “Could I place Aaron at Edgewood?” To try to answer this question I had to consider the history behind Edgewood Plantation and needed to re-examine Aaron’s military records. Going through Aaron’s military records again, depending on their accuracy, I was able to place him within 15 miles of the plantation by mapping out the distance between the battles his regiments took part in around Edgewood. That — mixed with the fact that Edgewood was used as a signal post by the Confederate Army to spy on the Union Army camped at nearby Berkley plantation with more than 100,000 troops — really made me question if Aaron B. Young would have come in contact with Edgewood. Even if he had, though, what could have happened to him at Edgewood that would lead him to haunt the location especially since he had not died there? 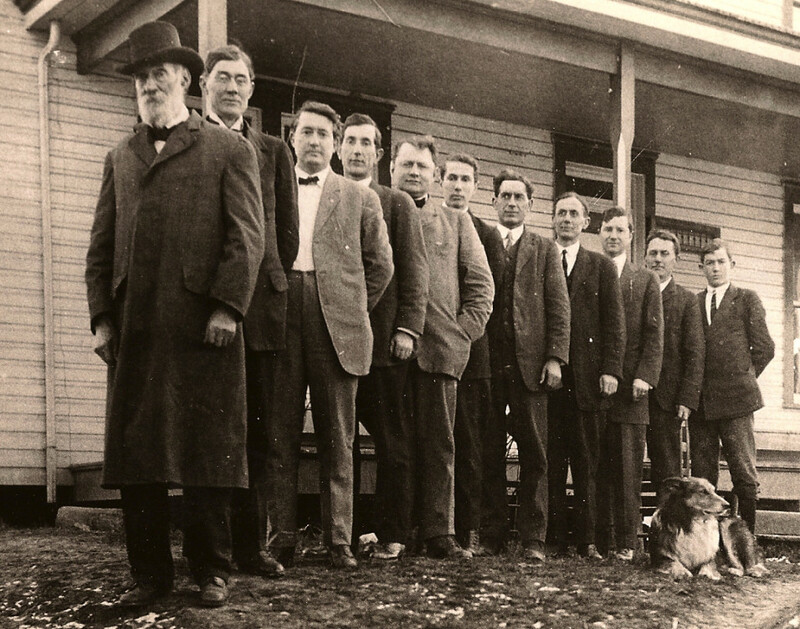 Still, whether or not Edgewood is haunted by the ghost of Aaron Young, his ghost is alive and well — in the genealogical sense — through the stories of his descendants. The episode featuring Edgewood Plantation, with my research involving Aaron, aired months later. And this led to another interesting twist: I was emailed by one of his descendants. As we had told the owner of Edgewood, I explained to his descendant that it was nearly impossible to prove beyond a doubt that Aaron haunted the location. However, for paranormal investigators, it was interesting to find that a confederate soldier by the name of Aaron Young did exist in the area. As different as these two worlds may seem at first glance, it was my love of history and genealogy that pushed me into the paranormal. It gave me the opportunity to use my research skills in historical locations I never dreamed of having the opportunity to visit. From old abandoned hospitals, jails and places of historical importance in the United States, to European castles, World War II forts and Mayan Ruins, I was intrigued by the idea that the past may still be playing out in those locations. It also made me question, if ghosts are people who have passed, who might my ancestors be haunting? I too am fascinated by what one can uncover through their genealogy. Great story Kris! It is impressive I’ve Loved all these kind of things I wish I could do what you do because it’s so interesting to me thanks Kris. Wow Kris, very interesting. I would love to delve more into my history I just have to come up with the extra money and time. So this leads me to a question? I have tried to research my Great Grandfather. 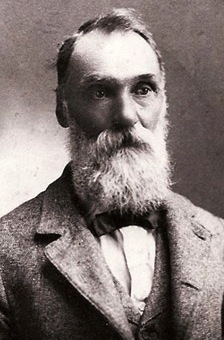 He was 100% Malicite, a tribe in Northern Maine and New Brunswick, Canada. I have difficulty zeroing in on locating exact records. The catch is that since he was a native american, he could come and go as he pleases. Do you know of a data base in Canada or the US that holds names of native americans? Thanks for the great history lesson. I look forward to reading many more. I am also a genealogy enthuseist. I have often thought the same thing, that the paranormal and genealogy are similar. I also have a fascination with the paranormal and have had a few ghostly experiences. This type of research helped me find some long lost relatives of my husbands also. This type or research done in genealogy can be helpful sometimes in finding the living as well. 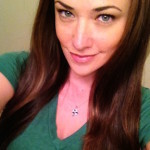 I used to enjoy watching you on Ghost Hunters as well. Although I am much older than you,(I could be your mother), I certainly can say we share very similar interests in history, genealogy and the unexplained. I have had things happen to me, that I most definitely cannot explain. Not many believe when I tell then what happens to me. My late Mother and her sisters, pretty much the only ones who ever believe. Find things fascinating when experiences do happen. Wondered what had happened on the show, all of a sudden it seemed you had disappeared. Mind you in Canada, in my province, we are not up to date with all of the episodes. Grant just left. 😅 In Genealogy the search never seems to end, I have been digging up my relatives since 1981 ….. some years more time to spend than others. Now live in Canada’s easternmost city, and the place where many of my ancestors first settled after leaving England. It is an old city, old and well, my sister laughs when I say some areas I find creepy. Good luck on your adventures.